SEATTLE, Feb. 28, 2018 /PRNewswire/ -- Paul G. Allen, Microsoft co-founder and philanthropist, announced today that he is committing $125 million over three years to support the Allen Institute for Artificial Intelligence (AI2) and to launch Project Alexandria – a new research initiative on common sense artificial intelligence (AI). Common sense represents one of the most fundamental and difficult problems for AI. Paul G. Allen, Microsoft co-founder and philanthropist, announced on February 28, 2018 that he is committing $125 million over three years to support the Allen Institute for Artificial Intelligence (AI2) and to launch Project Alexandria – a new research initiative on common sense artificial intelligence (AI). Paul G. Allen, Microsoft co-founder and philanthropist, announced on February 28, 2018 that he is committing $125 million over three years to support the Allen Institute for Artificial Intelligence (AI2) and to launch Project Alexandria – a new research initiative on common sense artificial intelligence (AI). This video explains what Common Sense for AI is. 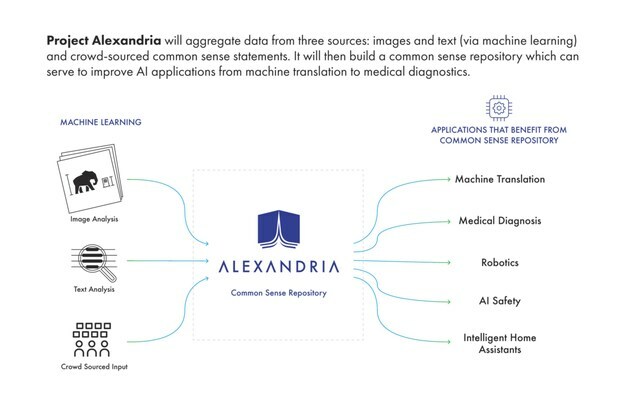 Dr. Oren Etzioni, Chief Executive Officer of the Allen Institute for Artificial Intelligence, speaks on Common Sense for Artificial Intelligence and Project Alexandria. "When I founded AI2, I wanted to expand the capabilities of artificial intelligence through high-impact research," said Mr. Allen. "Early in AI research, there was a great deal of focus on common sense, but that work stalled. AI still lacks what most 10-year-olds possess: ordinary common sense. We want to jump start that research to achieve major breakthroughs in the field." "This is an extremely complicated challenge," said Mr. Allen. "If we want AI to approach human abilities and have the broadest possible impact in research, medicine and business, we need to fundamentally advance AI's common sense abilities." The $125 million commitment will fund AI2's existing projects and the new Project Alexandria. The project will integrate knowledge developed in machine reading and reasoning (AI2's Project Aristo), natural language and understanding (AI2's Project Euclid), and computer vision (AI2's Project Plato) to create a new, unified and extensive knowledge source. This knowledge can then be used as a foundation for future AI systems to build upon. "Despite the recent AI successes, common sense—which is trivially easy for people – is remarkably difficult for AI," said Oren Etzioni, CEO of AI2. "No AI system currently deployed can reliably answer a broad range of simple questions such as: 'If I put my socks in a drawer, will they still be in there tomorrow?' or 'How can you tell if a milk carton is full?' For example, when AlphaGo beat the number one Go player in the world in 2016, the program did not know that Go is a board game." "Common sense is the precondition for general intelligence; until we get there we will be stuck with narrow AI that is rarely robust and never as flexible as human reasoners," said Gary Marcus, founder of Geometric Intelligence (acquired by Uber) and professor of psychology and neural science at NYU. "I am hugely excited about Project Alexandria. There's only been one serious large-scale effort to endow machines with common sense, and it was launched over three decades ago. The time is right for a fresh approach to the problem." AI2 was founded in 2014 by philanthropist and Microsoft co-founder Paul G. Allen, with the singular focus of conducting high-impact research and engineering in the field of artificial intelligence, all for the common good. AI2 is led by CEO Dr. Oren Etzioni, a renowned researcher in the field of AI, and employs more than 80 top-notch researchers and engineers, attracting individuals of varied interests and backgrounds from across the globe. AI2 prides itself on the diversity and collaboration of this team and takes a results-oriented approach to complex challenges in AI. For Paul Allen's Vulcan Inc.